A tooth with no nerve inside it is a dead tooth. The nerves inside the teeth are the ones responsible for letting us know whether an ice cream is cold or our coffee is hot. Some people falsely believe that having no nerve in a tooth instantly means that they are completely free from toothaches. Although it is true that the tooth can no longer sense cold and hot anymore, not all is gone. You see, there is little space left in the middle of the tooth that contains dead tissue, which can set the table to numerous bacteria to feast and lead to serious tooth infection within the tooth. Why does a tooth with a dead nerve get infected? Once a nerve inside a tooth dies, your immune system recognises dead tissue as foreign body and starts various defence mechanisms to get rid of it. 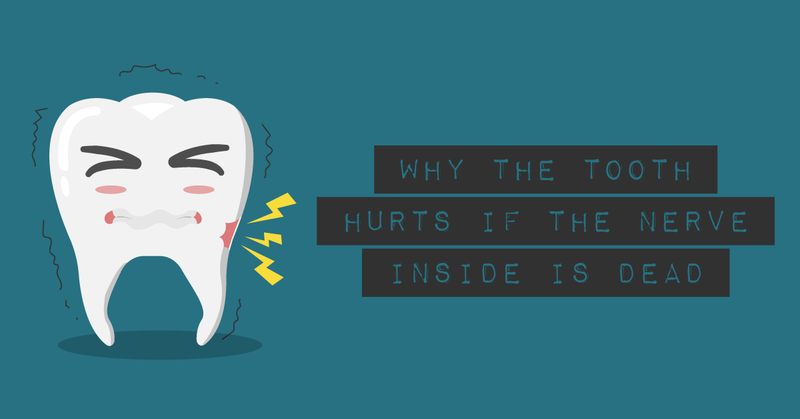 This is when an inflammation begins forming around the root of this tooth, which is a very complex process that involves different cells and substances sending the brain signals that something is wrong; hence, the pain. Remember, pain is your body’s normal reaction to protect you. Most of the time, the dead tissue gets infected with oral bacteria through saliva or plaque. Depending on your immune system and how aggressive these microbes are, the infection can be slow or fast developing. Yes, you may not feel a toothache anymore, but this will be only for a while. A tooth which has a dead nerve inside of it will give you some discomfort, tenderness, or ache in the infected area. It is like having a severe frostbite on a toe. When this happens, the blood supply to the toe is cut off, and it dies. The dead toe then begins to rot and bacteria multiply. The same things occurs to a tooth with a dead nerve; it begins to rot and then becomes infected. The next stage involves the leakage of the infection out of the tip of the root. This means that the infection spreads to the bone around the tooth root, and an abscess starts. At first, the tooth is tender to bite on and gradually starts to ache all the time. This is a process that can take from days and up to several years. How does a dead tooth look like? As soon as the tooth dies, you can’t tell which one is dead and which is healthy and alive. The dead tooth looks like any other tooth. However, over time (it could be years) it will start to become grey. This is because the very small blood vessels in the nerve break down. As a result, they leak red blood cells, and the tooth gets darker as time goes by. Once there, there is no return. The tooth cannot get any lighter again; not on its own. You may be able to whiten that tooth with a teeth whitening procedure after a root canal has taken place. What is the treatment for a dead tooth for nervous patients? Both the infection and tooth need to be assessed clinically and radiographically, so the best treatment option is carried out to eliminate the source of infection and its further spread. Of the two possible treatments to deal with a dead tooth, the one that saves the tooth and requires no extraction is the root canal. However, each case is different and requires a meticulous examination and discussion. For nervous patients, meaning people with dental-related phobias, The Dental Suite has the perfect solution. We practice Sedation Dentistry, which is the latest in the field, that allows people to have a worry-free dental experience. That way, a root canal is no longer something to be afraid of. On the contrary, you feel completely relaxed while listening to your favourite music and being in a specially designed environment that promotes calmness and relaxation. Have more questions about Sedation Dentistry? Do you think you have a dead tooth and want to have it checked out? This is where the phrase “Better safe than sorry” fits perfectly. So, don’t waste any more time. Contact us and book your first complimentary consultation. We will be happy to welcome you to our clinic.